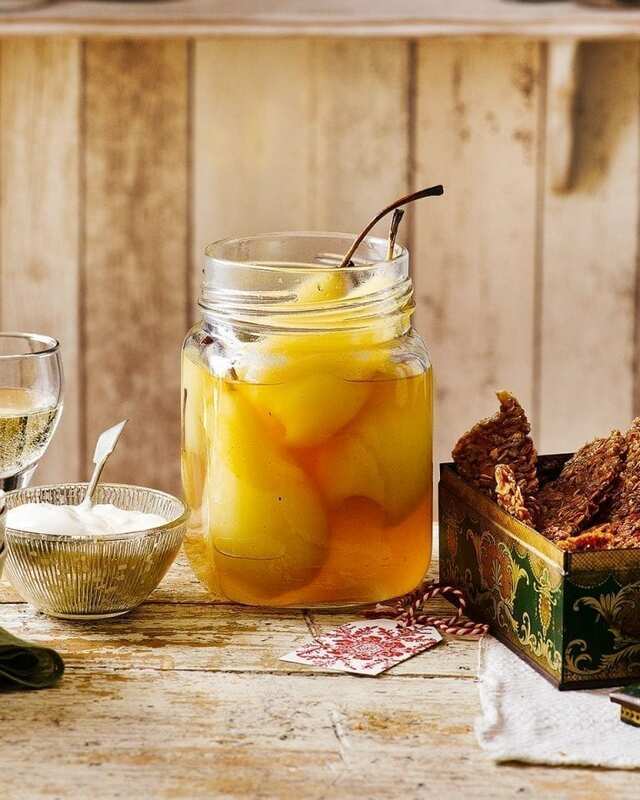 The pears travel well in jars and no amount of jostling can spoil the flapjack crumble shards, making them a great homemade gift. Heat the oven to 200°C/180°C fan/ gas 6. For the flapjack, melt the butter, brown sugar and golden syrup in a saucepan over a low- medium heat, stirring occasionally. Put the remaining flapjack ingredients (apart from the yogurt) in a large bowl, mix well, then stir in the melted ingredients. Line a large baking tray with baking paper and spread over the flapjack mixture. Bake for 10-12 minutes until golden brown. Remove and leave to cool completely, then peel off the paper and break up into pieces. Store in an airtight container. Meanwhile, peel and core the pears, leaving the stalks intact (optional), then put the wine, sugar, lemon zest and vanilla pod in a large saucepan. Bring slowly to the boil, stirring to dissolve the sugar. Add the pears and enough water to just cover. Cut a piece of baking paper to fit the pan, scrunch it up, then open it up and lay it on the surface of the poaching liquid. Simmer for about 25 minutes, turning the pears every now and then, until tender (see tip). Don’t pierce the pears too often as it will spoil the look of them. Transfer the cooked pears to a bowl, put the liquid back on a high heat and reduce for 25 minutes or until syrupy. Pour the syrup over the pears, allow to cool, then keep covered in the fridge or decant into jars. Serve the pears and syrup warmed through on the hob or at room temperature with the flapjack crumble and yogurt/cream. Depending on ripeness and size some pears may take longer to cook. A skewer should pierce with no resistance. The pears will keep for 4 days, covered with cling film in the fridge or sealed in jars. The flapjack crumble will keep for 5 days in an airtight container.